Workplace eye injuries happen to an estimated 2,000 workers every single day in the U.S. Do the math and that’s one about every 45 seconds, more than 700,000 every year. What are the biggest reasons for eye injuries? Workers not wearing eye protection, or wearing the wrong type of eye protection. What it costs injured workers and their families in pain and suffering cannot be measured in dollars. But the U.S. Bureau of Labor Statistics (BLS) measures the economic impact and estimates the cost at $300 million annually in lost production, worker’s compensation, and medical expenses. In fact, according to the BLS, the manufacturing industry has the highest number of eye injuries, with more than 8,000 year. We all know how quickly an injury can happen. We’re not expecting it, so we’re not ready for it. It’s estimated that 90% of all eye injuries are preventable, and wearing the right eye and face protection is the best prevention. Almost 70% of accidents are caused by flying or falling objects that are smaller than the head of a pin. Common objects like wood chips, metal slivers, dust or sand are ejected from tools, blown by the wind, or fall from above a worker. Grease, chemicals, and other fluids can splash, objects can dislodge from machinery, and UV radiation (welder’s flash) and steam can burn. In one study, the BLS surveyed injured workers and found that an estimated 60% were not wearing eye protection at the time of their injury. In many cases, protective eyewear was not required or it was left up to the worker to decide whether or not to wear it. Inspect your work area and eliminate loose dust or unstable debris that could fall on you or others at the workstation. Make sure tools have no loose parts that could dislodge during use. Make sure employees know how to use tooling and the hazards to watch for. Make sure you wear the right safety eyewear for the job. Safety glasses should be in good condition with no cracks. Make sure safety glasses fit snugly so they stay in place and there’s no space for objects to slip through a gap. 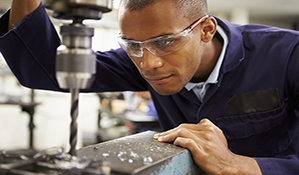 According to the BLS, a high percentage of eye injuries in workers who were wearing eye protection occurred when objects or fluids went under or around the glasses. Wear a full face shield if your job requires it. If your job doesn’t require safety glasses? Opt to wear them anyway if you encounter conditions with flying objects (from mowing grass to operating a CNC machine). Clean off dust and debris from hardhats, hair, even your forehead and brows before removing safety glasses. Brush, vacuum, or shake away loose debris from the workstation surface and above it. Keep dirty hands and clothing away from your eyes. Wash your safety glasses regularly. Do not rub the eye. Rubbing could cause worse injury by scratching the eyelid or eye itself. Flush the eye with plenty of clean water at room temperature. Tilting your head under a running faucet or hose is a good way to flush the eye. Seek medical treatment if flushing the eye doesn’t remove the speck, or if pain or swelling develop. Foreign objects – Do not flush the eye with water if an object larger than a speck is in it. Seek medical care immediately. Do not try to remove the object yourself. Chemical burns – Flush the eye immediately with plenty of clean water or drinkable liquid, and seek medical care. Blows to the eye – Apply a cold compress or bag of crushed ice without applying pressure to the eye. Seek medical care if pain persists, or swelling, blurred vision, or discoloration occur.